Wednesday was another gorgeous day in paradise. 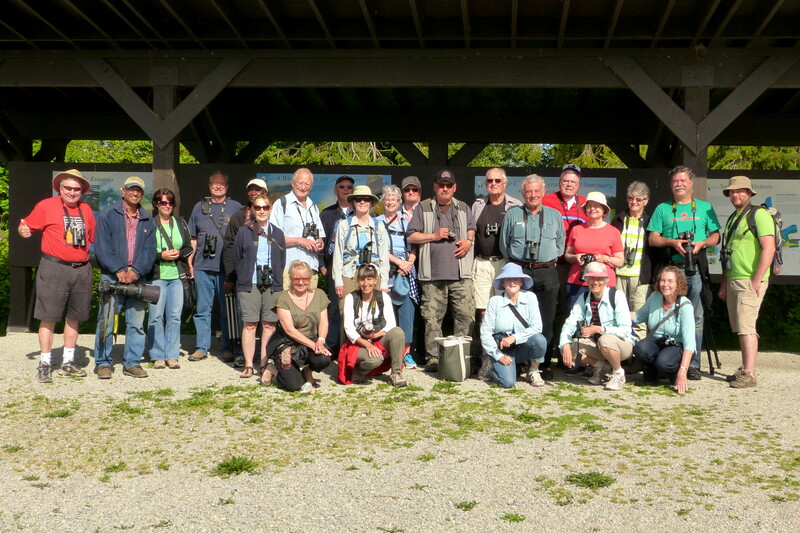 Twenty-four DNCBers visited the Tsa Tsu Shores Heronry then spent the rest of the morning at our “Mecca”, Reifel Bird Sanctuary. 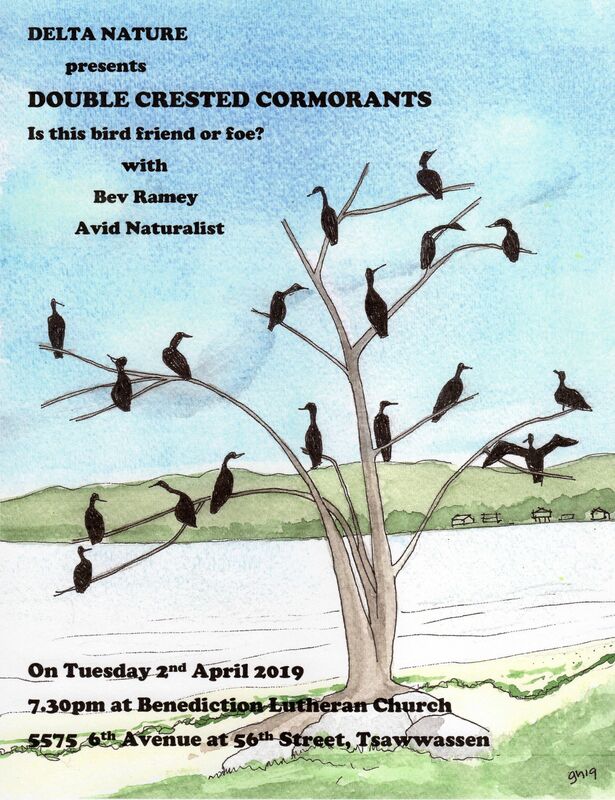 Hi-lites included: 400 nesting pairs of Great Blue Herons, 3 day old Sandhill Crane colt, Bullock’s Oriole, Western Tanager, Cinnamon and Blue-winged Teal plus lots of other stuff up-close-and-personal and in breeding plumage. Check out the DNCB Picasa link for beaut photos by Marion, Jim, Terry, Liz, Greg, Jim and hopefully others (Tony?) soon. Twelve of us (Gerhard with Terry & Mike, Greg with Glen & Jim, wealthy Indian Land Baron Tony had the three babes Pauline, Jean & Nicki, and Pt. Bob Paul was with me) left Petra’s at 7:30 a.m. for Tsa Tsu Shores. The estimated 400 nests at this Great Blue Heronry were very active, most with a parent standing guard over hard-to-see tiny young. Others were sitting on eggs and some were even gathering nesting material. We couldn’t locate the Guardian Bald Eagle nest, but a few saw a gorgeous Bullock’s Oriole gathering nesting material in the shrubs below. We decided to check out the Causeway and met Tall Rick who was casing the few remaining Brant Geese in the Bay. 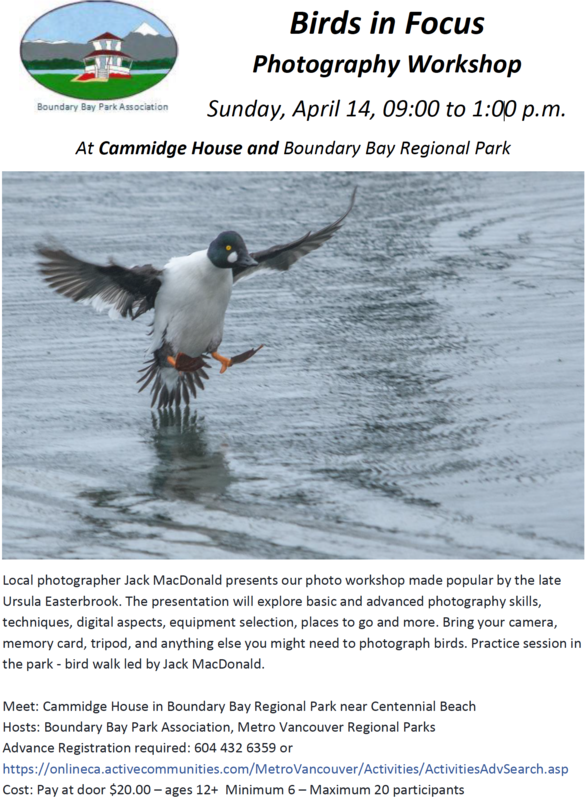 We also saw Bufflehead, Common Goldeneye, Lesser Scaup, Common Loon and a Black Oystercatcher (currently guarding eggs). Rick pointed out a huge raft of Pacific Loons in the distance with some Pigeon Guillemots there too. As we were scheduled to be at Reifel for its opening at 9:00 a.m., we continued driving through the TFN land and the Ladner fields. We stopped at the TFN Development at 28 Ave and 41B Street to check for Tall Rick’s Wilson’s Phalarope. We only found a Savannah Sparrow; however, on return from Reifel we (i.e. my vehicle) found a flock of Western Sandpipers with Least Sandpipers among them, but no Phalarope or Red Knots (seen Tuesday). The other Twelve were all waiting patiently at Reifel when we arrived, watching the Rufous Hummingbirds at the front feeder. They were: Jonathan & Lorraine, Tony & Erica, Rob & Marylile, garrulous Otto, Marion, Kirsten, Mary-Pat, Liz without Alan, and Donna; they like their names in print. Following a brief introduction, and recognizing the dysfunctional nature of this group, we gathered quickly at the Info Billboard to take the mandatory Group Photo. As usual, it was a bit of a Gong Show, as we cajoled a confused visitor to take the shot of us 24. Regarding bird sightings, lots of Brown-headed Cowbirds, House Sparrows and Red-winged Blackbirds at the feeders, but some spotted a gorgeous (that’s three times) Western Tanager. Red-eared Slider Turtles were sunning on a log. Along the trail we heard and saw Wilson’s and Yellow-rumped Warblers, lots of nesting Marsh Wrens (Marion saw a Bewick’s Wren), and House Finches (one yellow) and American Goldfinches. Tree Swallows were in and out of several nest boxes and Barn Swallows were building mud nests under eaves. We saw both Mallard and gorgeous (that’s four) Wood Duck families. One Wood Duck pair had 10 “few-day-old” babies in tow as a Bald Eagle circled above; I wonder how many will survive. 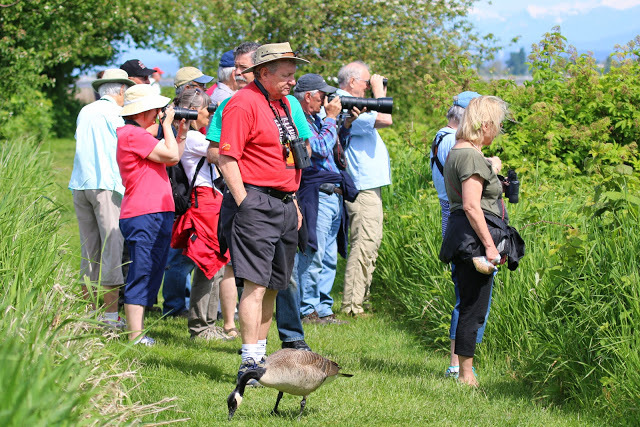 Since the Sandhill Crane Colt was one of our target birds, we went to the “viewing area” where Reifel’s famous TV/newspaper star Dan Dixon, the Crane Fighter, was monitoring the birds and the horde of photographers. The second 3-day old Colt (the first colt drowned shortly after birth on Sunday and its body was still on the nest now occupied by a pair of Canada Geese) was hanging close to the parents, but very cooperative for photos. We followed the inland trail, saw several Cedar Waxwings but couldn’t find (or hear) a Black-headed Grosbeak. At the tower, in the pond we saw Northern Shovelers (but no babies as seen earlier), Northern Pintail, Gadwall and two Target species, several gorgeous (that’s 5) Cinnamon Teal and one Blue-winged Teal. Along the outer dike we got better views of these birds as well as a feeding flock of Long-billed Dowitchers with a few Greater Yellowlegs among them. Approaching Noon, we headed back to the entrance, and left starving as again no one brought beer or food (I think PB Lorna is at a wedding in Ontario). On the way home, my vehicle (Paul, Glen & Jim) stopped at a friend’s barn to see the resident Barn Owl. It was not only a gorgeous day (that’s 6) but very productive for seeing some neat birds. 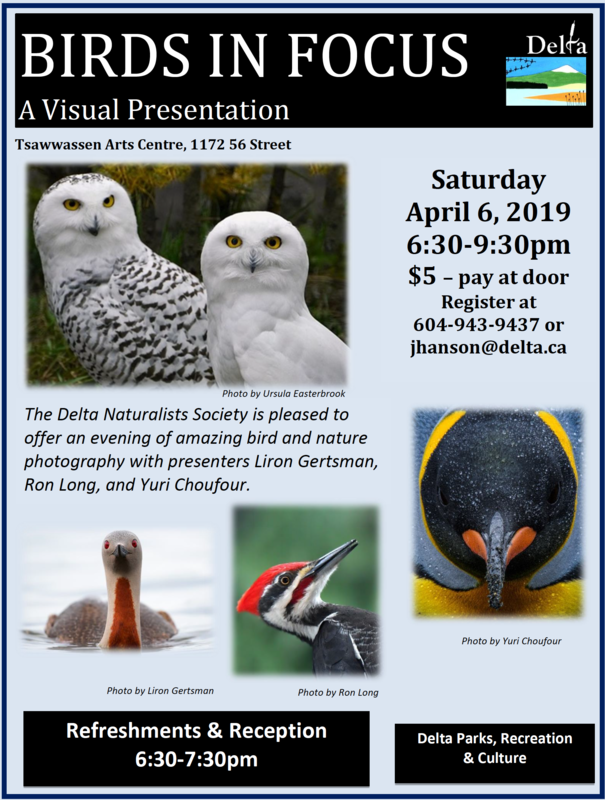 This entry was posted in Blue-winged Teal, Bullock's Oriole, Cinnamon Teal, Pigeon Guillemot, Reifel, TFN, TsaTsu Heronry, Western Tanager. Bookmark the permalink.